February is Discover Languages month. The American Council on the Teaching of Foreign Languages does a great job of promoting language learning in the USA. The ACTFL website has excellent resources to help you in your quest to expand language learning and appreciation in your community. You will also find links to interesting sites that allow you to explore languages and the use of languages around the world. I especially liked the Modern Language Association’s interactive map. 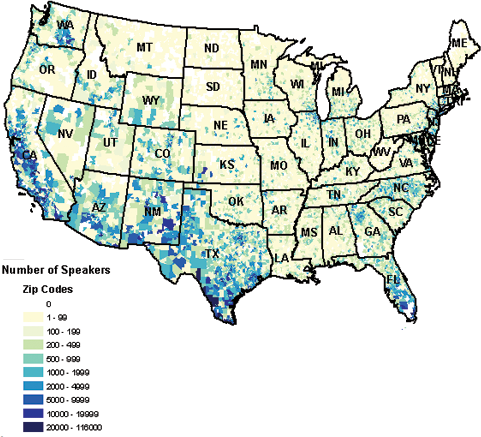 Students can enter a language and view a map showing how many speakers of that language are found in various parts of the US. You can also see where the language is taught in the US. It’s very interesting to see language distribution in this manner. Below is a map I created using the Modern Language Association’s website showing the number of Spanish speakers in the US by zip code.